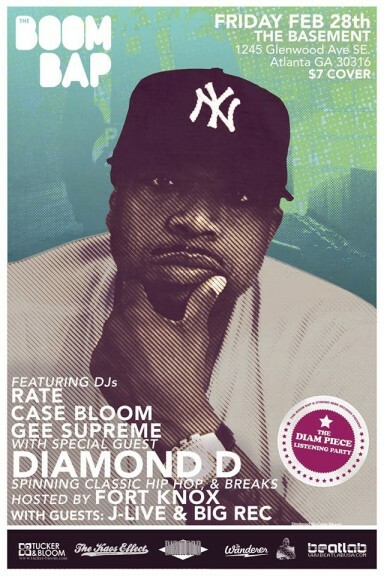 If you’re a hip-hop head and missed Diamond D’s listening party for his new album, The Diam Piece, you may have to wait until April or May to hear the acclaimed producer’s latest addition to his unmistakable raw-with-finesse style. But for those who made it to the Basement on Friday courtesy of the Boom Bap, it was a reminder of good hip-hop music’s relevance and reach. “Y’all are the first to hear the album I’ve been working on for the last two years,” Diamond said. And true to the Diggin’ in the Crates crew sound, all the tracks kept heads nodding hard. A track featuring Pharoahe Monch kicks things off with a bang — the rumble of bass over a touch of smooth that Diamond is known for. Next up: The unmistakable voice of Pete Rock, putting up verses between a crazy guitar lick and D’s ever-present knock. Fat Joe and Chi Ali team up on a track Diamond said was “that fighting music right there.” Understandably so. I could see how this track would get you live for the night. On the dopest track yet, Hi-Tek and Diamond himself rip over a stealthy sick beat, grimy in all the right ways. The horn break is ill.
Ladies love a production worthy of their skills. That’s why Rapsody, and Atlanta’s own Boog Brown and Stacy Epps shine on this next one. Pump your brakes, indeed! J-Live’s flow is his best friend, and they reward each other well on this next track. Good stuff. That Diamond had to remind folks that Sadat X is from Brand Nubian makes me SMH. The Kill Bill “Bang Bang” sample is doing just that. Ras Kass is still doing his thing. This track has a West Coast funk feel to it, which makes sense. “Where’s The Love?” with Talib Kweli is the perfect combination of this self-proclaimed geek’s high pitch and guitar soul. The details — particularly an “I ’oun know” answer to the track’s title — make this song. DJ Gee Supreme held down the decks for most of the night, while special guests Big Rec and J-Live kicked off the show, which was hosted by the ever-present, always amped Fort Knox. If it’s mostly the voice that gets you up, then Big Rec had people jumping. Three tracks in, he rounded out his set with an a cappella rhyme worthy of everyone’s attention. J-Live commanded the mic much like he did the crowd, the true definition of an MC — master of ceremonies — as he explained at the opening of his set. That said, I wonder if demanding attention is better than getting it freely. The crowd was obviously there in a show of support. If only the crowd had shown more support by staying through the entire The Diam Piece album. Regardless, there’s truly nothing like good hip-hop music, and I’m encouraged to see legends like Diamond continue to make moves and bring comparatively new artists along for the ride. ← Chante Sez … What in the world?